At the top of the local business ladder, were Italian, Jewish, Greek, Armenian, and Lebanese businessmen. They hired family first and locals next. Albuquerqueans were helped to make the transition from an agricultural society to an industrial society by those immigrants who had already experienced the difference in the their old home countries. Most immigrants had come here to escape poverty and understood the plight of the people. Bars, general stores, and wholesale liquors were the owner by Italians while prepared food businesses were mostly Greek owned. The Lebanese liked marketing almost everything you can dream up. Jewish businessmen tended to go with the new market, created by the Fred Harvey chain. Indians; Indian Lore and Indian Crafts. It was mainly the Harvey chain that sold tourists the idea to take bus tours out to the pueblos and reservations to see Indians in their natural habitat, and consequently, gave value to Indian jewelry, blankets, even the way Indians dressed and interest in Indian art; sand paintings, their dances and their pottery. 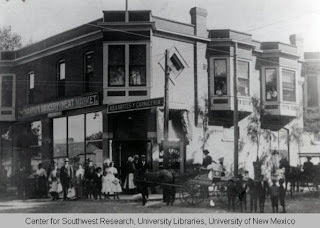 New Mexico was also very culture friendly, because of the Archaeology school at UNM. 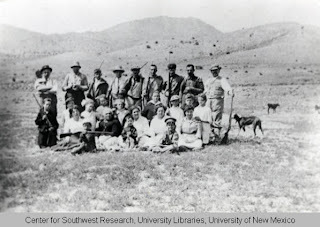 Grade School teachers who attended UNM (University of New Mexico) made their students aware of Indian culture and their rightful place in New Mexican society long before it became popular to be Indian friendly elsewhere. Jewish merchants established trading Posts that bought and sold Indian craftsmanship and hired Indians to works in their shops and homes. They moved into Indian country to be closer to the source of their income and were so accepted by the frienmdly culture that one Jewish man became the chief of a tribe. 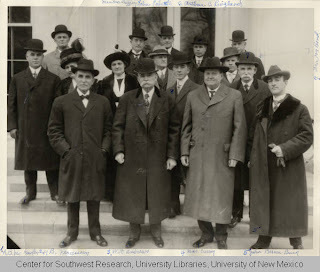 Another became governor of New Mexico. The Italians reigned in the business district of Albuquerque though. 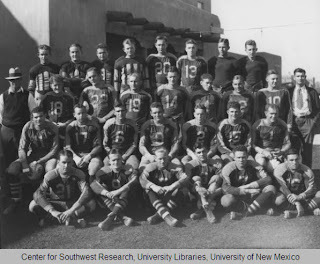 Their children went to UNM and became business, social and political leaders, teachers, lawyers, doctors, nurses, etc. All immigrants were welcomed with open arms by the people. The same people who became the consumers and a labor force. Ideas were exchanged between the immigrants and the populace except for a few individuals in other immigrant groups. It was only the Italians who spoke the language of the state fluently, and could also do business in several dialects spoken by the tribes. Jewish businessmen had the Indian trades in silver and artifacts but more than that they prided themselves in mastering Native American languages. One Lebanese man ran a grocery store in Isleta Pueblo. He married an Isleta Indian and fathered two beautiful daughters that made quite a name for themselves later in life. Champion Grocery, operated by Alessandro and Amadeo Matteucci and located on the corner of Seventh Street and Tijeras avenue, was one of the largest Italian-owned grocery stores in Albuquerque. Jubilee Parade. 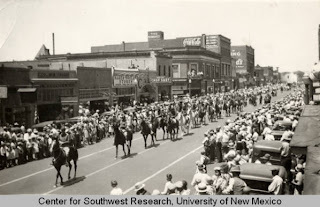 Horsemen passing down Central Ave., near Second St. as crowds look on; business enterprises visible at left; ca. 1930. Thank you for stopping by. We welcome your comments.